Crystal Cruises was formed in 1988 by the Japanese company NYK Lines to sail worldwide cruises, different from most Japanese owned cruiselines that mostly keep their cruises closer to home. Although NYK operated just the modest Asuka at that time, they intended the new ships for the Crystal Cruises brand to be quite big for Japanese standards. The beginnings of the company were really laid out in 1986, when a special department within NYK was investigating in which sector the new company could operate at best. People within the company sailed on many ships and many cruiselines from 1986 onwards to get to know the western cruise culture. From their findings, the new Crystal Cruises was established as an upmarket, luxury line. Their goal, to provide the most elegant and most luxurious cruise experience in the cruise industry. Nippon Yusen Kaisha itself was formed in 1885 when two companies, Yubin Kisen Mitsubishi Kaisha and Kyodo Unyo Kaisha combined forces. Firstly, the company concentrated on route's in Asia close to Japan, in 1893 they opened a long-haul line to Bombay in India. Three years later, NYK also opened lines to America, Australia and Europe. Crystal Serenity was built in St.-Nazaire at Chantiers de L'atlantique as yardnumber H32. She is the largest cruiseship that is owned by a Japanese company. When Crystal Cruises was formed in 1988, it was a great breakthrough in Japanese passengershipping. 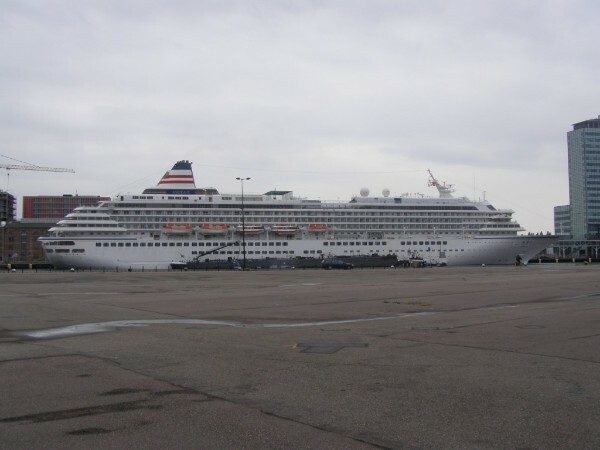 The company ordered a large cruiseliner and their headoffice was to be located in Los Angeles. Still, we can say Crystal Cruises was a Japanese firm, due to their original owners. The first ship, Crystal Harmony, was launched in 1989 and started cruising at the 24th of july of that year. She measured around 49.000 tons and had room aboard for 960 passengers. Due to the backing of the Mitsubishi company, owners of NYK, the ship was built at the Mitsubishi Heavy Industries wharf at Nagasaki, Japan. For the cabins, mock-ups were built at the wharf and those were tested by executives of the wharf and their wives, who spended the nights in them and reported back or those were comfortable enough to be put into the ship. It was the firstpassengership that NYK had ordered since the beginning of the second worldwar. It took five years for Crystal Cruises to add a sistership and double the fleet. 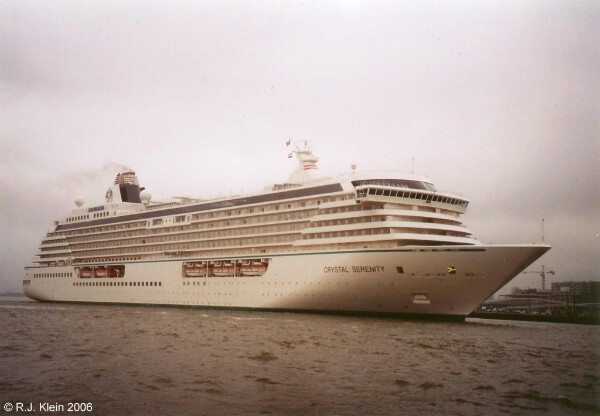 In 1995, the almost equal Crystal Symphony was added, slightly larger then her earlier sister at just over 51.000 tons. She was built at another yard, though, she came from the Kvaerner-Masa Yards in Turku, Finland. As a special treat for their passengers for the coming of the new millennium, Crystal Cruises offered the possibility to buy one out of 2000 specially made bottles of Crystal champagne. Of course, the bottles did cost 2000 dollars each! A thirth ship was added in 2003 under the name of Crystal Serenity, so this time it took the company eight years to enlarge its fleet. At this time, also the statement was made that another ship would be added to the fleet, if conditions permitted. It was clear that the company didn't want to enlarge itself too soon and just look at the markets they were working in. Instead, the company is truly keeping its fleet up to date with large investments made in rebuildings and refreshing of the exsisting ships. 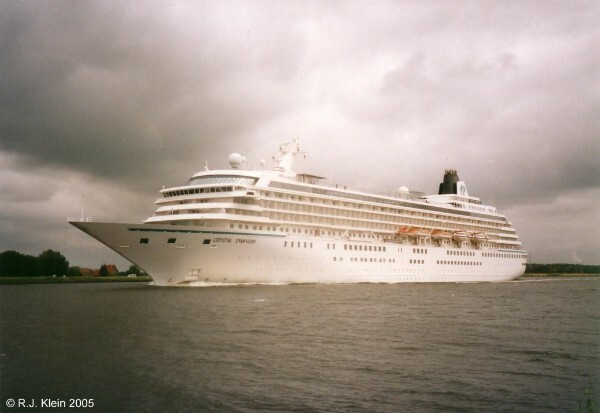 While no new ship was added to the fleet, in 2006, just three years after the introduction of Crystal Serenity (that was the largest Japanese passengership ever built), the fleet was even reduced when Crystal Harmony was replaced in the fleet of NYK itself to become Asuka II. She replaced Asuka, that was moved to Phoenix Reisen of Germany as their Amadea. For NYK, a larger ship was needed. Below, Crystal Symphony is seen sailing the Northsea canal passage from Amsterdam during the summer of 2006. Crystal really seems to wait untill the time is ripe for enlargement, but they seemed to do pretty well with their two-ship fleet. Not surprisingly, because readers of the Condé Nast Traveller have voted for Crystal Cruises to be the Best Large-Ship Cruise Line for the 16th time in a row. But to keep up with other up-market cruiselines, the company had to invest in new ships. A new opportunity arose when NYK sold Crystal Cruises to Genting Hong Kong/ Star Cruises in march of 2015. Now Norwegian Cruise Line is more or less controlled through the US-based Apollo Management, it is also the possibility for Genting/ Star to again gain a part of the worldwide cruisemarket as Star Cruises is only sailing in Asian waters. And the sale gave Crystal Cruises the financials to invest. The Genting Group has a large financial backing, being a worldwide company in hospitality and leisure. Next to that, the group has interests in a ferryservice from Florida to the Bahamas (where they own a casino), agriculture, resorts, real estate, oil-exploration and bio-medical industry. In 2006, the companies first ship was placed in the fleet of mothercompany Nippon Yusen Kaisha as Asuka II, the replacement of the earlier and much smaller Asuka. Below, the ship is seen in NYK colours at Amsterdam in 2008. And investment came, as Genting revealed a very ambitious plan for Crystal Cruises a few months after the sale. At least thee new 100.000 ton ships were ordered from the Lloyd Werft at Bremerhaven (that is actually also owned by Genting), each just having space for over 1000 passengers. Also, the new ships start a new concept, Crystal Residences, as there will be a seperate part aboard the ships that have appartments where people can actually live. As if this isn't exciting enough, Crystal will also be expanded with a rivercruise section, Crystal River Cruises, from the spring of 2017 onwards. Also, Crystal already recieved a luxury yaught under the name of Crystal Esprit from the end of 2015 onwards. Last but not least, Crystal Luxury Air was started up, aquiring at least one Boeing 787 dreamliner. Normally, the plane seats 300 people, for Crystal this is limited to 86. This is a totally new concept, airline 'cruises' to several parts of the globe. With this, Crystal offers a very unusual experience and places itself in the forefront of luxury travels. Their first airline cruiser was named CrystalSkye and will be delivered to Crystal at the 1st of august 2017. Her christening will take place in Las Vegas, I guess an industries first, on august 12th. Her first cruise will depart Hong Kong on september 30th and take her passengers on an African safari from Nairobi, Kenya and then on to Tahiti. The plane has a luxury social lounge with stand-up bar and an executive chef prepares diner in two modern galleys. Of course, a premium wine-list is also served. As if all those plans are not enough yet, in the beginning of february of 2016, the company also announced that they had signed an option for purchase of the SS United States, the 1952-built oceanliner that has been in lay-up since 1969. During a period of nine months, Crystal will pay for the docking fees of the ship at her current berth in Philadelphia, a time during which they will conduct a feasibility study for bringing the ship back to luxury cruiseservice. Of course the money for this comes from Crystal's new owners Genting, the company that formerly controlled Norwegian Cruise Line, also during the period when this latter company aquired the United States as well as the Independence, another classic American icon that now has already met the breakers torch. Or this complete surprise will turn into reality will still has to be seen, as there have been many plans during the now almost 50 years in which the ship has seen no service whatsoever. And as we know, none of those plans have been turned into reality. For booking information, visit the website of Crystal Cruises.